Can India-EU strategic partnership focus on climate change, clean energy? Trade and security was the focus of the recently concluded India-EU summit, but the two entities need to move beyond that? The 14th EU-India Summit concluded in New Delhi today (October 6). The main agenda of the summit was strengthening trade and investment ties. While the EU was represented by Donald Tusk, President of the European Council and Jean Claude Juncker, President of the European Commission, India was represented by Prime Minister Narendra Modi. 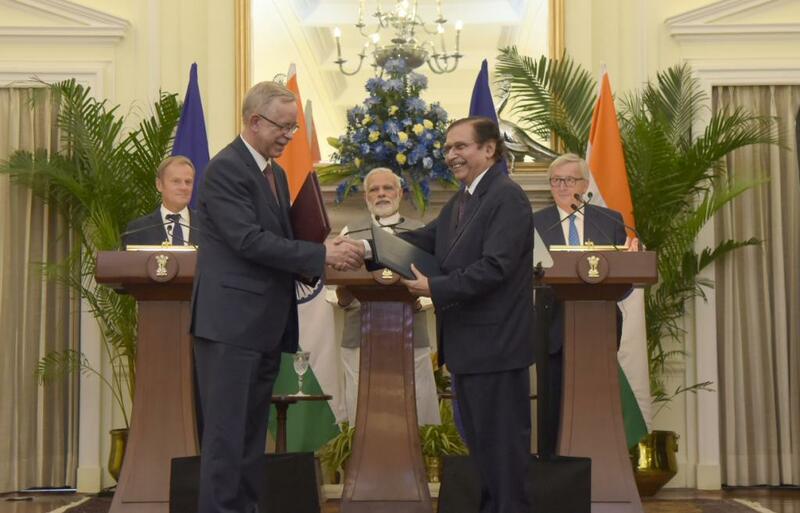 Three pacts were signed: one between European Investment bank and International Solar Alliance; second on Bangalore metro rail project and third on mobility of Indian and European researchers. Discussions on migration, refugees and stepping up maritime security were held among other issues. They called for a free trade agreement between India and the EU. The EU-India strategic partnership was launched in 2004 and the joint action plan (JAP) was developed in 2005. With the initiation of negotiations on Broad-based Trade and Investment Agreement (BTIA), the nature of this bilateral relation seems to have moved towards being trade-based. Other issues, including foreign policy, security, environment and terrorism also formed part of the JAP and discussions under the bilateral EU-India Summit were held every year from then on until 2013 when the process was disrupted due to the deadlock on BTIA. The EU’s other strategic partners are China, Mexico and Brazil. The latest EU-Russia strategic partnership was signed in 2011 but failed on account of annexation of Crimea and host of Russian activities viewed as disruptive and unstrategic by the Europeans. The EU-India relations have struggled from 2009 onwards. The Eurozone debt crisis, policy incoherence in the EU as a result of its expansion, policy paralysis in India under UPA II and disruption in negotiations on BTIA are the key reasons cited by experts for the same. During the same phase, the EU’s role in areas of global governance such as climate change also decreased significantly. Its diplomacy failed during the 2009 Copenhagen Summit, which was meant to adopt another deal to replace Kyoto Protocol. Its role in the Paris Summit, 2015 was also largely defined by French leadership. However, things have been improving since then. The EU has emerged as a stronger economic entity and India has new leadership under PM Modi, focusing on development and good governance. EU and India renewed their relations during the 13th EU-India Summit held in Brussels in 2016, which saw resumption of BTIA talks and adoption of an Agenda for Action 2020 to jointly guide and strengthen the India-EU Strategic Partnership in the next five years. The Agenda identifies key areas of cooperation, including foreign policy, security, clean energy, climate change, clean coal, migration and refugees. The ambit of cooperation extends to India’s flagship initiatives, including Make in India, Clean Ganga, Clean India, Smart Cities and biotechnology, sustainable energy and Sustainable Development Goals (SDGs). The Agenda for Action 2020 has a separate section on climate change under which both the EU and India seek to work on enforcing intended nationally determined contributions (INDCs) which the countries submitted leading up to the Paris Agreement. Cooperation on other components of Paris Agreement such as transparency and accountability framework, adaptation and disaster preparedness also forms part of the vision document. Regarding energy, the cooperation is focused on energy efficiency in buildings, development of renewable resources, including solar and offshore wind, smart grids, energy research and innovation. The economic partnership seems to have been mutually beneficial. The EU is India’s largest trading partner with India receiving around US$ 83 bn FDI flows from Europe during 2000-17, accounting for 24 per cent of the total foreign investments. But now, the nature of partnership must be revisited and made more dynamic by including other pressing issues and confronting us today. Climate change is one of them. After the US pullout, the EU is well positioned to lead the climate agenda despite deadlock over Brexit. The EU has been a leader on clean technologies. Research points out that globally, 40 per cent of the high-value technologies started in EU. In the field of renewable, EU has proved its mettle. At 276 GW, EU has the highest renewable energy capacity in the world. It has also set a target for all new buildings to be nearly zero-energy by 2020. The odds are in the EU’s favour to claim its resurgence in climate change issue. Domestically, while the focus should be on building consensus among member states to adopt a common EU stance and policies, the already existing strategic partnership with countries, including India and other emerging powers, can provide necessary forums to institutionalise its leadership role globally. While the EU has been reaching out to China in terms of renewable technology and policy coherence, the engagement with other players has been restrictive and limited to commerce and trade largely. Both India and EU are natural partners and both share common concern over issues of global governance like climate change. Opportunities must be explored and harnessed in climate and clean energy by both the partners.